THE chairman of Woking Amateur Boxing Club and a Knaphill newsagent have been shortlisted in the BBC Surrey Community Heroes Awards. 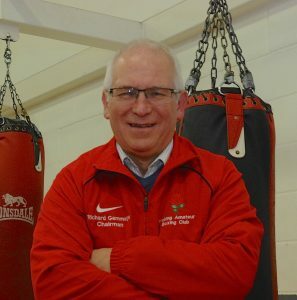 Richard Gammage, who joined Woking Amateur Boxing Club in 1967 as a fighter, is a finalist in the Sport category. He became a committee member and amateur boxing judge in 1975 and then chairman of the WABC in 1985. On hearing that he was a finalist in the BBC awards, Richard said: “It came as a nice surprise – especially after having been formally recognised for my [outstanding] services to sport at the Woking Awards two days earlier [19 October.]. Prior to then, I had never been nominated for anything. Jim set up the first Christmas market in Knaphill in recent years, taking over the whole shopping area from his shop in Anchor Crescent to Barclays Bank in the High Street with a variety of stalls. The markets, and other charity events, have raised thousands of pounds for various good causes. “It helps to bring the community together. Everyone works together and the turnouts have been excellent. There were about 300 people at our first event and more than 1,000 at the last one. The BBC Surrey Community Heroes Awards, now in their sixth year, are dedicated to celebrating unsung heroes from across the local area. Over recent months, listeners have been invited to make their nominations across nine categories including Fundraiser, Volunteer and Young Achiever of the Year. All the shortlisted nominees will attend a prestigious awards ceremony at the Gatwick Crowne Plaza Hotel on Monday 28 November, when the overall winners in each category will be announced. The event will be broadcast on BBC Surrey’s Facebook Live page and there will be highlights on the Breakfast Show the following morning. For the first time, Latest TV will film the entire ceremony, to be shown at a later date. For the full list of nominations, visit www.bbc.co.uk/bbcsurrey.